What comes to you when you think of Delft blue? Often it are the vases that are the first to pass by. The Delft blue vase is becoming increasingly popular. We have the traditional tulip vase with different layers and openings, the decorative vase that we often see on cabinets and the functional vase that we often use for flowers. At De Hollandse Klompenwinkel the Delft blue vase is of course also a permanent part of the collection. Especially the Delft blue vase with wooden aids is really a bestseller. Reason enough to expand our collection. Are you aware of what we have in store for you? Read on soon! A personalized gift is of course very nice to give and receive. Especially the personal and authentic edge is often appreciated. With us you will find different gifts that can be personalized with your own text, logo or color. But, the Delft blue vase with wooden tulips was still missing. We have made changes! It is now also possible to have the Delft blue vase with wooden tulips printed with your logo. You can of course choose your own logo and give the vase as a promotional gift to your customers and business contacts. Do you know someone who started their own company or, for example, opened a new store? Then of course it is also very nice to choose the company logo of the recipient. Whatever you choose, with a personalized gift you always score. Fortunately Delft blue leaves the (unjustified) bad image behind them. In fact, Delft blue is totally hip! More and more people are proud to appreciate this piece of Dutch pride. The rich images of windmills, clogs and tulips, we see regularly in the contemporary interior. It even works a bit addictive. Once Delft blue is home? Then many more items often follow. That is why our printed Delft blue vase with wooden tulips is a nice gift for someone who really has the collection virus. In addition, it is great to give this vase with tulips to someone who does not live in the Netherlands. Delftware is still a part of Dutch culture and you can let someone get acquainted with our pride. What could be more fun than a colorful bunch of flowers? Unfortunately tulips often only stay nice for a few days to weeks. Fortunately, you do not bother with wooden tulips. Wooden tulips can not spoil so that they are cheerful for months or even years. Our printed Delft blue vase is filled with these wooden tulips. You can choose a motley collection of different colors or one specific color. It is now of course just what they are intended for. If you want the Delft blue vase to be printed with your company logo, it might be nice to choose tulips in the color of your company logo. So there are plenty of options! Buy a printed Delft blue vase with tulips? How does ordering at De Hollandse Klompenwinkel work? Actually, it is very simple. You can make a choice online at your convenience. Do you opt for a bouquet of tulips in a Delft blue vase? Then you also have the choice of different colors of tulips. You can take a mix of colors or choose a specific color. Then of course the best thing is: your logo! You can mail this to us so that we can print it on the vase. In addition, we can also package your order. This is very useful if you have the gift sent directly to the recipient. 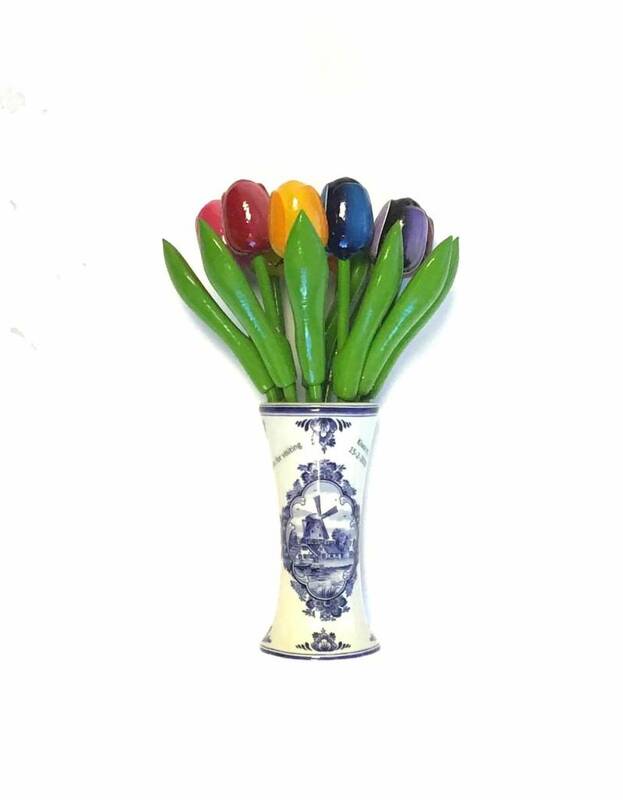 A Delft blue vase with colorful tulips and your logo can be ordered easily at De Hollandse Klompenwinkel!